Maryland Aerospace Inc. (MAI) has a US Army Space and Missile Defense Command contract to design and deliver a Kestrel Eye Block 2M Earth imaging spacecraft as part of the Army's Kestrel Eye program. The US Army Space Missile Defense Command is developing Kestrel Eye as an electro-optical nanosatellite-class imagery satellite that will be tasked by the tactical ground component Warfighter. Capable of producing 1.5 meter resolution imagery, Kestrel Eye’s data will be downlinked directly to the same Warfighter via a data relay network that is also accessible by other Warfighters in theater without any continental United States (CONUS) relay or data filtering. The intent is to demonstrate a tactical space-based imagery nanosat that could be proliferated in large numbers to provide a persistent capability to ground forces. The primary objective of the demonstration will be to task the satellite to take a picture of a designated ground object of interest and have that image relayed back to the ground Warfighter during the same satellite pass (i.e., within an approximately 10-minute tasking-to-product cycle). 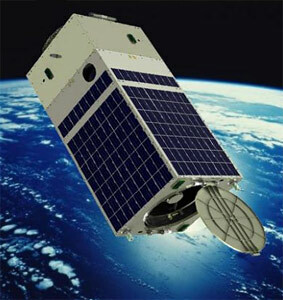 Maryland Aerospace Inc. (MAI) builds the Kestrel Eye 1 satellite based on their MagicBus platform. Up to 30 Kestrel Eye satellites are considered to be launched, if the concept proves to be viable. The first Kestrel Eye satellite was launched as a secondary payload on a Falcon-9 v1.2 launch to the International Space Station (ISS) in 2017. It was deployed via the JEM airlock using the NanoRacks Kaber deployer. It operated for 10 months until August 2018. After that, the Kestrel Eye program was ended.